Here are my goals for Bout of Books 9.0, and this is where I’ll track my progress. I used the Goal Template kindly offered on the Bout of Books website. Since I still have to work that week (M-F), I estimate I could possibly at the very most read seven books (although we’ll find out how accurate that is). I’ll be reading in the evenings after work, and then most of the weekend (aside from eating and maybe showering). So my goal is to read at least five and possibly more of the books listed below. I read during the majority of my free time this week. So I have to conclude that my original estimate of being able to read seven books in a week was way off, since I didn’t even hit my five book goal. At the same time, my usual average is somewhere around 1-2 books a week, so I definitely read more than usual. 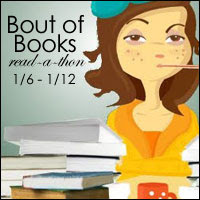 Bout of Books was great! Looking forward to next time!